What's with all the pizza gimmicks? Drones and bluetooth sneakers: What's with all the pizza gimmicks? If Domino's and Pizza Hut can't win you over with their pizza, they'll try to get you with their flashy stunts. Domino's has tested delivery by drone, robot and reindeer. It just started delivering to parks and beaches — and even promised to help cities pave potholes. Pizza Hut developed bluetooth-enabled sneakers that let you pause your TV and order pizza with the push of a button. It has given out parkas with the same insulation as its delivery pouches, and swag from pizza-themed sweaters to Christmas lights. Stunts are common in fast food. Burger King once offered a free Whopper to anyone who deleted 10 Facebook friends. But when it comes to outrageous gimmicks, there's no topping the pizza chains. And with their most extravagant promotions, Domino's (DMPZF) and Pizza Hut are trying to send a message. Tim McIntyre, executive vice president of communications for Domino's, said that hotspots and other delivery promotions are "all trying to reinforce the message that we are the delivery experts." That's more important for pizza chains than other fast food companies, which rely more on drive-thrus and store visits. Pizza gimmicks are all about reminding you that a particular brand can get it to you fastest and easiest. 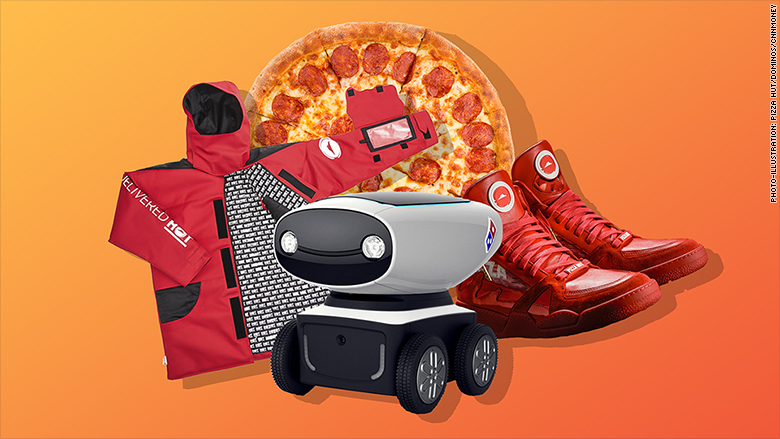 Pizza Hut's insulated parka and pie tops and the Domino's delivery robot. Domino's also has ordering by text, Alexa, smart watch and Slack. Even its more extreme efforts — like a test of drone delivery in New Zealand — are serious, McIntyre said. "They're not publicity stunts per se," he said. "They look like stunts and they sound like stunts and they play like stunts, but they're actually real." Many of Pizza Hut's stunts also emphasize a commitment to speedy delivery. For the past two years, Pizza Hut has sold or distributed Pie Tops — high-top sneakers with the button to pause TV and order pizza — around March Madness. The sneakers were "really consistent with our business strategy of making it easier to order our pizza," said Zipporah Allen, the company's chief marketing officer. And when Pizza Hut unveiled its insulated pouches, designed to keep pies 15 degrees hotter, the parkas helped raise awareness for what otherwise would have been a boring announcement. These Pizza Hut sneakers let you order pizza with the push of a button. If it seems like these stunts are becoming more ostentatious, there may be a reason. When so-called fast casual dining became popular about a decade ago, Pizza Hut and Domino's introduced artisanal pies and gluten-free crusts. But fast food has made a comeback. And now that sales are back up, fast food companies are "letting their hair down a little bit," said Sam Oches, editorial director of Food News Media at QSR magazine. Fast food eaters aren't particularly loyal to one brand over another, BTIG analyst Peter Saleh said. And with more delivery options from Grubhub and Seamless, companies face more competition. All fast food companies are trying to reach customers outside the restaurant, Oches said, through delivery, drive-thrus and in-store pickup. But for rivals Pizza Hut and Domino's, fast delivery is about competitive edge. They may be thinking "the pizzas taste about the same, the quality's about the same, but if I can get it to you quicker ... I can win out," said Henry Boyd, a marketing professor at the University of Maryland's business school. Gimmicks also simply help remind customers that restaurants like Pizza Hut and Domino's are around. Pizza Hut often pairs promotions with sports events, like March Madness. This summer, it tried to cash in on July 18, "the slowest sports day of the year," by bringing back its Cheesy Bites Pizza for a limited time. One November, it teamed up with XBox to give out hundreds of free gaming consoles. Domino's, for its part, recently held a World's Fastest Pizza Maker competition in Las Vegas. Last year it launched a baby registry. Boyd suspects that the two companies may be playing off each other. "This back and forth is very common," in the fast food space, he said. "The brass ring can be taken from you by competitors." 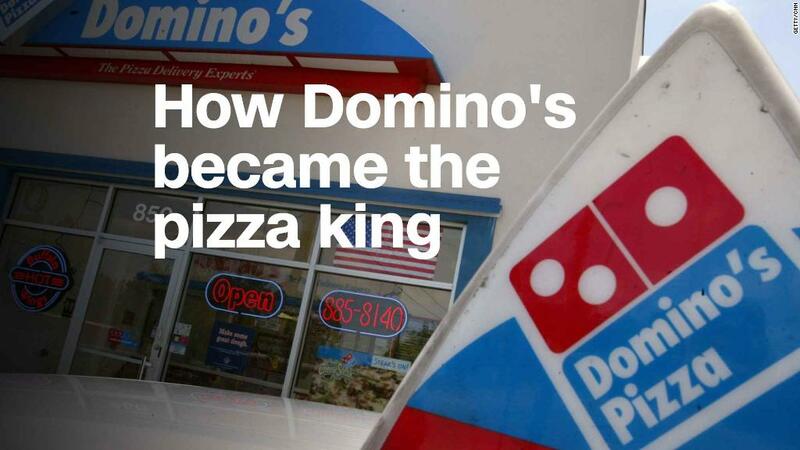 Pizza Hut knows it — last year, Domino's sold more food than Pizza Hut for the first time. But Saleh pointed out that the promotions may not move the needle in terms of sales. "Some of these will work," he said. "A lot of them are very short-lived." Ultimately, he said, it's "really just about grabbing the customer's attention."